30 Aug 1945: One POW dies of heart attack. Dr. Walter Norman Riley, Flt Lt, RAF - Report of the camp doctor and Senior POW in this camp. Describes camp and attitudes of Jap staff. Also read Dr Riley's affidavit regarding prior camp, Narumi. Aerial photo courtesy of Wes Injerd. 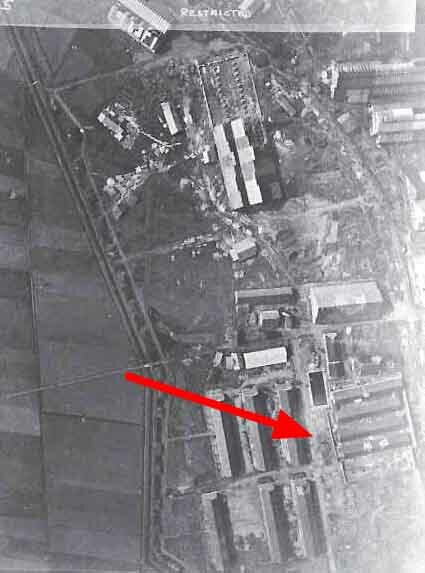 Note the camp is located in lower right and has "PW" clearly marked on the roof. August 29, 1945: 10.00 am Planes heard: great excitement. Circle over then come lower and after a couple of test runs one plane drops first parachute flying very low. Returns for second run and drops a third and on the next run the 4th package drops and then the plane sideslips and crashes 50yds from us. Rush out to find plane has demolished a house and lies upside down. 2 men are brought out - one injured. [USS Belleau Wood] The pilot is dead: a regrettable accident. Cases contain emergency rations, cigarettes, bag of bread and magazines. Had a slice of bread - delicious, just like cake! 30th August Had just appeared for funeral service of pilot when planes appeared; dropped more supplies and note asking for information about airmen and indicating how to convey the information to them. Three men arranged on parade ground: one lying flat (dead Pilot), one sitting up (wounded airgunner) and one standing (uninjured). Sqd Leader indicated that he had got the signal and later when service was held they returned in formation and flew over. Tateyama Heavy Industries Co; manufacture of small steam rollers, used for building of airfields or roads. See SCAP Report, Item #10. These men all came from Narumi POW Camp, formerly under the Osaka POW Command. Men arrived from Narumi POW camp; hell ship not applicable to this camp. However, Most of the men had earlier arrived at Narumi POW Camp in a shipment from Hong Kong on the SS Soong Cheong, stopping in Formosa then transferring to the Toyama Maru. Detailed rosters include service numbers, POW numbers, ranks and other data. Available for the asking. According to Dr. Riley, men came from another camp (Narumi) in the Nagoya area. One man died (after surrender) on 30 August 1945 from a heart attack. Name not ascertained but it is reasonable to assume this was a result of cardiac beri beri.